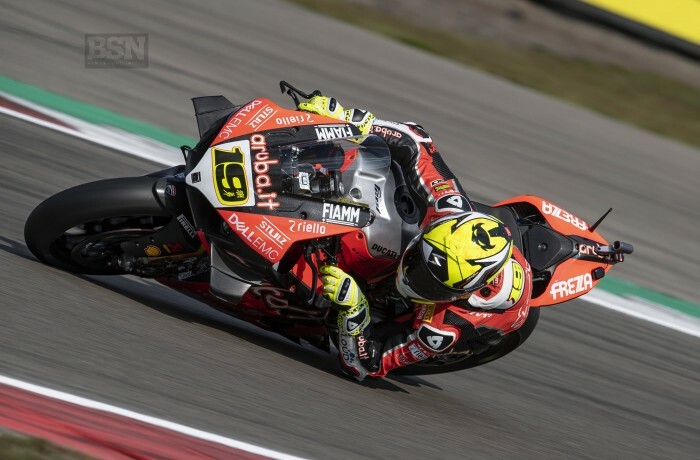 Aruba Ducati’s Alvaro Bautista was gifted WorldSBK pole position at Assen this morning when a red flag brought Superpole to a premature end. The championship leader had set a 1’34.740 to claim top spot on the timesheets while the rest of the pack were preparing for their final effort when crashes from Ryuichi Kiyonari and Toprak Razgatlioglu brought out the red flags with only a minute and a half left. It means there was not enough time for riders to get from pitlane to the start/finish straight before the chequered flag came out, so race direction ended the session. Michael van der Mark took second place on the Pata Yamaha with BMW’s Markus Reiterberger completing the front row while reigning champion Jonathan Rea is marooned on the third row. Alex Lowes, on the second Pata Yamaha was fourth, just 0.195 seconds from Bautista. One of those riders to get caught out by the timings was Leon Haslam (Kawasaki) in fifth place, and Friday’a fastest man, Tom Sykes (BMW Motorrad) who was six-tenths up on his personal best and on a pole schedule. He was limited to sixth. Chaz Davies (Aruba Ducati) placed seventh with old enemy Rea next to him. Privateer Kawasaki riders Jordi Torres (Pedercini Kawasaki) and Toprak Razgatlioglu (Turkish Puccetti Racing) rounded out the top ten, despite his crash. Leon Camier finished in 11th place with Sandro Cortese in 12th even though the GRT Yamaha man walked away from a whopping highside on the exit of the 140mph+ Meeuwenmeer early in the sesion. Eugene Laverty will be disappointed with 13th place on the Goeleven Ducati but not as upset as Marco Melandri will be with having only Michael Rinaldi behind him on the grid.